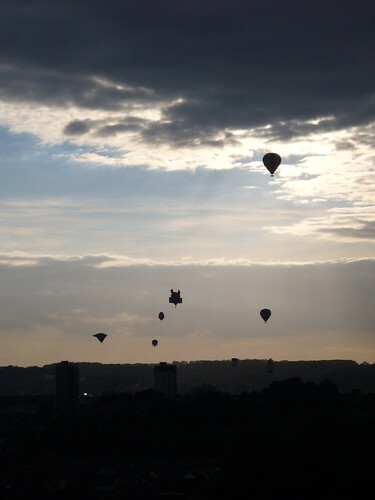 Bristol’s annual Balloon Fiesta has just wound up (I’ve written about this before, and taken photos too). 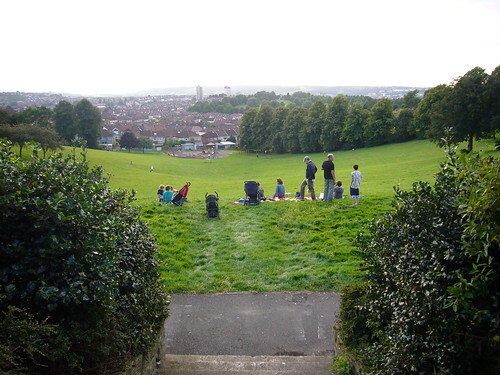 We’ve had some good weather recently and Perrett’s Park, which overlooks much of Bristol, has been busy in the evenings with people watching the launches taking place over at Ashton Court. Two out of three evenings the wind favoured us and the balloons passed by low overhead, much to the delight of all the children present. 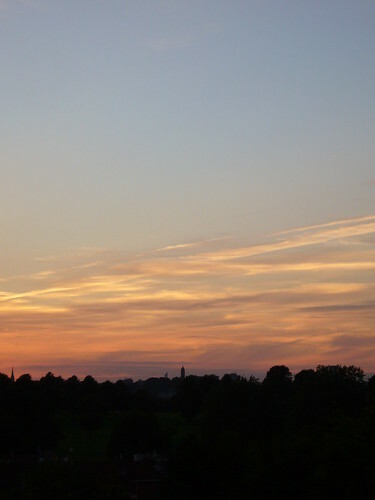 I didn’t take so many pictures this year, but you get the general idea from this – balloons at dusk. They do early morning launches as well, but as I was on earlies this week I missed them. As I mention above, the kids love the balloons. 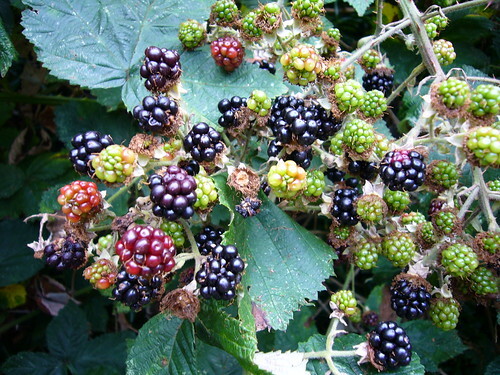 Our eldest has also just discovered another summer delight – wild blackberries. We’re fortunate enough to have a lot of green space around us even though we live in the city and at the overgrown local cemetery, the city farm and around the nearby allotments the brambles are heavy with blackberries at the moment which the kid would eat until she was sick if we let her. We went over to Arnos Vale before lunch and let Uma run around while we picked a bag or two to bring home. It’s great to be able to do this in the city; both Polly and I grew up in the countryside and we occasionally worry that our kids might miss out on things like this. We eventually tore Uma away from the free food and took our pickings home. We’re not sure what we’ll do with them yet. 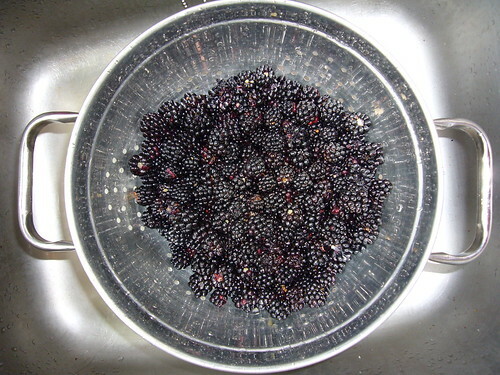 Crumbles, jams or just as they come. Yum! Hey, over a week since I last posted. That’s better than eight months. You’d think that I’d get more of a chance to do things like this at weekends given the fact I don’t blog from work, but it just doesn’t work like that when you’ve got kids. If anything, my weekends are busier and more manic than my workdays and I’m often more tired than on a weekday by the time they’re tucked up in bed. Besides, we often have friends or family over at weekends, which usually means the evening are full too. Not that I’m complaining about any of this, merely pointing out why no more likely to post at weekends than I am during the week. I reckon the most opportune times for recreational blogging for someone with a none-blog-friendly full time job and two small children are weekday evenings and the occasional moment like now when I’m home from work early and Polly’s out with the kids. In addition to all of this, the weather has finally improved and we’ve been spending our evenings sitting in the shade on our balcony looking out over Bristol. We’ve got a fantastic view, and I think you’ll agree that sitting outside sipping a drink and watching the sun set is hard to improve upon. There’s a couple more like this on Flickr (1, 2, 3), plus a whole lot more.